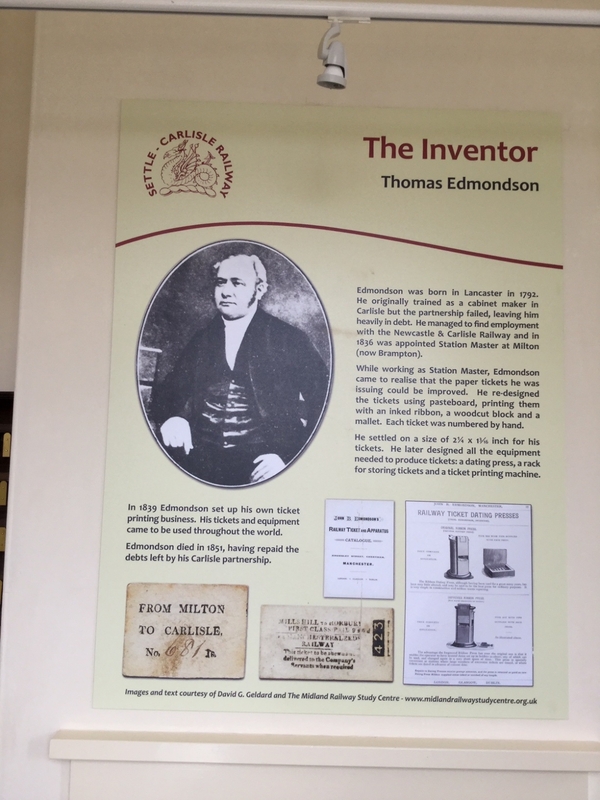 Thomas Edmondson, the inventor of the old style cardboard rail ticket that many people will still remember, is commemorated by this short video https://youtu.be/U8nQZZGblj4 . Thanks to LuneTube for this, http://lunetube.co.uk/ . He was born in Lancaster in 1792. He originally trained as a cabinet maker in Carlisle but the partnership failed, leaving him heavily in debt. While working as a station master, he redesigned the handwritten paper tickets then in use, by using pasteboard and printing them with an inked ribbon, a woodcut block and a mallet. He later designed all the equipment needed to produce tickets. In 1839 he set up his own ticket printing business. His tickets and equipment came to be used throughout the world. The photo shows the display at Ribblehead Visitor Centre, where there are also a ticket rack and tickets (not valid for travel on the Settle-Carlisle Line!). The Visitor Centre is now closed for refurbishment, will open again at Easter 2019.